Tom Gill is a London-based writer who blogs at www.revolting-europe.com on European affairs from a radical left perspective. The Spanish socialists have ditched ‘responsible opposition’. But have they got enough fight to stop Rajoy? ‘Responsible opposition’ has been the watchword of Spain’s socialists since their inglorious defeat by the right wing Popular Party at the elections of November 2011. Opposition leader Alfredo Perez Rubalcaba has made strenuous efforts to extend the hand of the loyal opposition to the government in a bid for a common approach to tacking the country’s deep financial and economic crisis. His language with respect to an increasingly cruel and authoritarian administration in Madrid has been remarkably muted. An understanding attitude with Prime Minister Mariano has been accompanied by a conspicuous absence of senior party leaders at the mass street protests that have become a central feature of Spanish life. But being ultra reasonable has yielded few discernible results. Rajoy has gone ahead solito with one austerity plan after another. Public services and welfare have been slashed. The most vulnerable – including illegal immigrants who are routinely exploited by unscrupulous employers dodging taxes and minimum health and safety provisions and now face no access to healthcare – have been targeted. With a hefty majority, Rajoy doesn’t need, nor wants, the hand of the Socialists. The Spaniards though, they could do with some help from the Socialists, acting as a proper opposition. A party that opposes Rajoy and his policies that are killing the economy, sending unemployment ever higher and spreading misery and poverty among the general populace. The failure to oppose Rajoy has to be the story behind the Socialists’ dire poll ratings. They are languishing at historic lows, and at around 24%, according to Metroscopia, are four points lower than that fateful November day when voters punished the party for their lethal embrace of austerity. The Socialists are also five points below the Popular Party, which has itself seen a collapse in support from a high of 46% in March this year. Less ‘responsible’ parties, are on the other hand, are on the up, with the radical United Left party now at a steady 12-13% over the past five months. 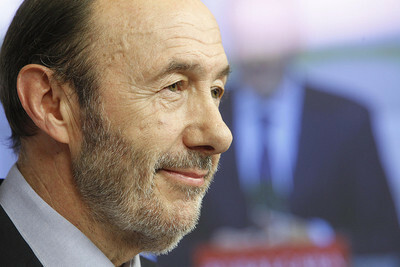 As a result, the leadership of Rubalcaba – a former minister who replaced former PM José Luis Rodríguez Zapatero in February this year – is coming under increasing challenge within the Socialist Party. One group of party activists has just produced a manifesto that calls on Rubalcaba to stop seeking ‘political pacts with the Right’ over cuts that ‘will only hurt Spain’, ‘humiliate’ Spaniards and undermine the central role of parliament. They want a ‘profound’ debate over policy and are demanding a new ‘left’ political project that will involve ‘head on opposition to the Popular Party’s policies of cuts’ and reconnecting with a civil society that is increasingly in open rebellion against Rajoy’s Government. Tomás Gómez, leader of the Madrid Socialists, has weighed in against Rubalcaba too. Gomez has been a vocal critic of the generous public support to the country’s profligate banks at a time of massive austerity for the 99%; in exchange for taxpayers money banks should become sources of public investment in the economy, he argues. The former mayor of Madrid has called on the party to campaign for a referendum on the country’s all but certain bailout by the Troika, in anticipation of which the government has announced plans for structural reforms – code for another turn of the austerity screw and roll-back of social, welfare and labour rights. Gomez is also calling for the party to demand a constitutional block on cuts to state pensions, which are feared to be next on the austerity hit list. Pensions are one of the most prized parts of the comprehensive welfare state established under the Socialist governments of Felipe Gonzalez in the 1980s and a highly sensitive issue for the party’s core voters. These proposals were debated at a closed session at the Socialist headquarters in Madrid last Sunday. Rubalcaba came armed with his own plans to the party’s powerful Federal Committee, comprising delegates chosen by the party’s Congress and its federations. The outcome of the meeting was a more radical agenda that rejects spending cuts hitting the majority and instead demands higher taxes for Spain’s wealthiest individuals and corporations, the elite who in the good times before the economic and financial crisis of 2007-8, benefitted disproportionately, in large part because of tax cuts and lax tax enforcement. The leadership also pledged to push for a ‘social sustainability law’ that would protect some public services from austerity measures. This is more fighting talk befitting the dramatic times. Whether Rubalcaba will convince without a mea culpa for the Socialists’ fateful decision to join the austerity fest in Spring 2010 and the ‘profound’ policy rethink demanded by disgruntled activists, remains to be seen. But for the sake of the welfare of millions of Spaniards, and his own skin, potentially at risk from a restless would-be rival like Gomez, he’ll need to match words with action. And, faced with a government commanding a solid majority, that action will need to be focused outside of parliament. A show of solidarity with the popular protest movement – again set to turn out in big numbers on Saturday – would be a good place to start.